Most visitors on these pages here have heard of the ancient Roman city of Ephesus and many have either already seen it or are going to visit it, but how many have heard about Aphrodisias? Probably very few because even though the city of Aphrodisias is not deliberately kept secret it's not really publicised that much either. The ancient city of Aphrodisias, once the capital of the province of Lydia, is located near the village of Geyre in the district of Karacasu 38 km south of Nazilli. In ancient times, the attractive marble buildings of Aphrodisias no doubt were impressive as they are today. An ancient and much revered goddess of fertility and womanhood, Aphrodite has reigned supreme in this area for many many centuries. 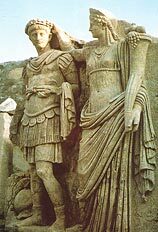 Aphrodisias was famous for its school of sculpture. The site's museum is full of cult statues of Aphrodite, but the most interesting item on show is the Zoilis Frieze, a series of carved panels honouring a local Roman citizen who was born a slave. The history of the city can be traced back to the early bronze age and there is even clear evidence of a chalcolithic culture prior to the 3rd millennium B.C. 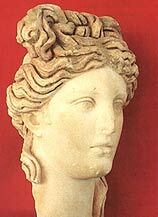 The use of the name Aphrodisias began after the 3rd century B.C., in the Hellenistic period. The spread of Christianity under the Byzantine Empire and the gradual adoption of Christianity as the state religion resulted in a marked change in the status of the city. The cult centre of Aphrodite declined in importance, to such an extent that the names Aphrodite and Aphrodisias were finally erased from all the inscriptions. Efforts were made to change the name of the city to Stavrapolis, the City of the Cross, but the local inhabitants preferred to use Caria, the name of the province. Geyre, the name of the modern village occupying the same site, is probably a corruption of the ancient Caria, which occurred after the Turkish occupation of the area. it does on a lofty plateau below the slopes of the Babadag which rises in the sparsely populated area to south of and between the towns of Nazilli and Denizli in the Maeander Valley area. 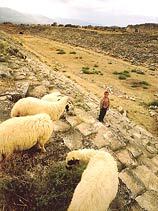 An interesting correlation that closes the gap of ages relating to sites like Aphrodisius is that the Maeander is a large and important river, known now by its Turkish name of Menderes, a river whose course is unpredictable and constantly changing and that gave rise to the word »Meander«, meaning "to wander off course". Perhaps you should wander a little off your own course and pay a visit to this archaeologically discovered but as yet touristi-cally undiscovered city dedicated to the perceived bringer of life, Aphrodite. One of the most attractive features of Aphrodisias is the ornamental gate constructed in the middle of the 2nd century. The name Tetrapylon refers to its being composed of four groups of four columns. The front row of Corinthian columns with spiral fluting look out on to a street with north-south alignment. The second and third columns of this fourfold structure are surmounted by a semicircular lintel with relief figures of Nike and Erotes amid acanthus leaves. The process of repairing and re-erecting the Tetrapylon columns was completed in 1990. The odeon, a building which differed from the theatre in being used mainly as a concert hall and lecture room, is in a fairly good state of preservation.Located immediately to the south of the temple, it was constructed in the 2nd century A.D. There were originally a larger number of tiers in the upper part of the buildings but these are thought to have been destroyed in an earthquake.The orchestra and stage building of the odeon were adorned with mosaics an statues now preserved in the museum and the auditorium was covered with a wooden roof. A fairly large architectural complex is to be found to the west of the odeon. Constructed in the Late Roman period, part of this building is thought to have later been used in the Byzantine period as the residence of a governor or bishop. It would thus appear that the temple and its environs preserved its status as a religious and administrative centre into Christian times. The agora, located between the temple and the acropolis was planned in the 1 St. century B.C. for use as a market and popular meeting place. It is composed of two Ionic porticoes over 200 m long and running from east to west. The southern portico, which is known as the portico of Tiberius, was systematically examined in the course of the older excavations, while the 1937 excavations carried out by the Italian team yielded extremely valuable friezes together with inscriptions written in praise of the Emperor Tiberius. Most of the reliefs consist of sacred or individual portraits surrounded by wreaths or garlands, masks and mythological scenes. The monumental gate of the agora is located at the eastern end of the Portico of Tiberius. This ornamental entrance was erected in the middle of the 2nd century but in order to prevent the flooding that followed the 4th century earthquake it was converted into a nymphaeum and connected to a water supply system to be used in controlling the water flow. This is thought to have been constructed in the 5th century and to have suffered severe damage in the 7th century earthquake. The baths constructed in the 2nd century during the reign of the Emperor Hadrian lie to the west of the Portico of Tiberius. This complex consists of a large central hall, probably the caldarium or hot room, surrounded. by four large rooms, the tepidarium, sýýdatorium, apoditerium and frigidarium (warm room, sweating room, dressing room and cold room respectively). It is a most imposing building with all the requisite facilities, such as labyrinthine underground service corridors, water channels and furnaces. In the excavations conducted here in 1904 the French archaeologist Paul Gaudin unearthed a large number of artistic works now preserved in the Istanbul Archaeological Museum. Begun in 1966, the excavations in the theatre area yielded a great deal of extremely valuable information regarding both the prehistoric and historic periods in Aphrodisias as well as very well preserved sections of the theatre building and a large number of statues and reliefs of the highest quality. The theatre building rests against the eastern slope of the acropolis. Construction was completed in 27 B.C. but in the 2nd century A.D. certain structural changes were made to make the theatre suitable for gladiatorial combats. The stage building was enlarged and connected to the cavea, a room for the wild animals was opened in the rear and some corridors were added. The Sebastion is a remarkable discovery. When the building was first unearthed in 1979 it appeared to have no relation to any other building but, as excavations were carried down to deeper levels, it became apparent that this consisted of a temple dedicated to the cult of the Emperor Augustus (Sebastos is the Greek equivalent of the Latin Augustus) and its surrounding complex. Of the temple only the foundations now remain, together with a few column bases, Corinthian style capitals and architrave blocks. In addition to the damage inflicted by the earthquakes in the 4th and 7th centuries, the remains of the temple also suffered from the use of the area for settlement in the Byzantine and Turkish periods. The temple, which was located at the eastern end of the Sebastion, consisted of two porticoes 80 m in length composed of half columns and a ceremonial way 14 m wide. At the western end there was a gate or propylon opening on to the street. Excavations both inside and outside the porticoes yielded a quite extraordinary quantity of reliefs and decorative panels. The most remarkable of these included depictions of the birth of Eros, the Three Graces, Apollo in Delphi, Meleager, Achilles and Penthesilea, Nyssa and the child Dionysus. There are also reliefs of some members of the imperial family and mythological figures. Those identified include Augustus, Germanicus, Lucius, Gaius Caesar, Claudius and Agrippa, together with Prometheus and Aeneas fleeing from Troy. There is also a particularly interesting group of reliefs symbolizing Claudius's conquest of Britain and Nero's conquest of Armenia. There are also a number of fragments depicting the peoples of the various countries with which Augustus had waged war or formed other types of relationships but these have suffered severe earthquake damage. It would appear from the epigraphic evidence that the Sebastion porticoes were built during the reigns of Claudius and Nero and were the gifts of two separate families. are slightly convex, giving the whole a form rather suggesting an ellipse. In this way, the spectators seated in this part of the stadium would not block each other's view and would be able to see the whole of the arena. The stadium was specially designed for athletic contests, but after the theatre was damaged in the 7th century earthquake the eastern end of the arena began to be used for games, circuses and wild beast shows. During the Roman period the stadium was the scene of a large number of athletic competitions and festivals. These competitions in the province of Asia Minor were modeled on the Olympic and Pythian games in Greece, and had the same name and organization as the Greek equivalent. These games were held with the permission of Rome and the granting of such permission was regarded as a signal honour. The games held in Aphrodisias were Pythian, not Olympic. These were complemented by the Gordineia festivals held in honour of the Emperor and with his special permission. The Museum of Aphrodisias is one of the most outstanding museums of western Anatolia. The monuments of unsurpassed value which have been found at the excavations are displayed here. Observing these finds and imagining them in their former places suffice to grasp the splendor of these antique monuments which once used to be. Especially the works of the sculpture school of antique Aphrodisias show the level of development of this art.